I could not think of a more appropriate title for today’s blog post. After all, I’ve kept many of you in suspense for months with claims of forthcoming “big news”. Some of you have even reached out to me saying you could barely take another teasing statement about it. If it’s become unbearable, I do apologise; things took longer than expected (as they often do). That said, you can breathe easy at last because today is the day. Here is what you have been waiting for. I can hardly keep it in any longer, and you’ve waited long enough, so let’s have it out: Chadhiyana: In the Company of Shadows has a publisher! If any of you have been following closely enough (perhaps acutely so) this may not come as a complete surprise. 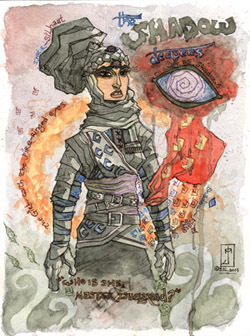 You may have already guessed as much, right down to the publisher in question: the up-and-coming Rosarium Publishing. They’re fairly new (two years new, to be precise), but they’ve already started to gain some attention in both the book and comic industries. I honestly couldn’t be happier than to be a part of what they’re doing, and I don’t think Chadhiyana (or I) could have found a better fit. Hints have been dropped since December when I posted on social media that I had been added to the authors’ page of the Rosarium Publishing website (rosariumpublishing.com). 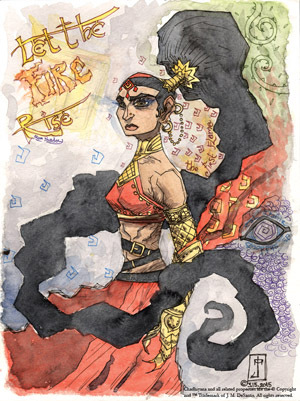 That same month, Chadhiyana was named as one of their upcoming titles for 2015 when ComicsDC interviewed Rosarium’s founder and editor-in-chief, Bill Campbell. 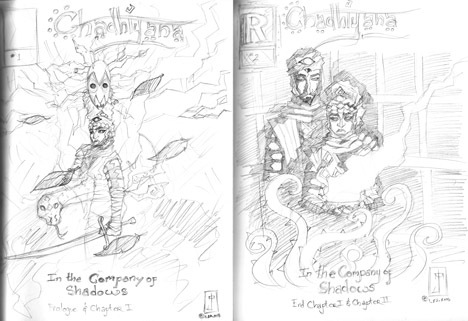 Perhaps less blatant was the vaguely drawn Rosarium R on the sketch I posted in January for the proposed cover for issue 2 of Chadhiyana: In the Company of Shadows. Though even before all of this I had a good feeling this was all going to come to fruition. In fact, I felt this way shortly after Bill Campbell happened upon my table at the 2014 Baltimore Comic-Con and afterwards contacted me about Chadhiyana. So why the long and cryptic silence, you ask? At the risk of sounding unreasonably pessimistic, I’ve had a long history of disappointments and unfulfilled promises in the publishing world (which I’ve written about in the past). While every step of the way I had faith this was going to happen, I wanted to make sure things were official before I went about bragging that I had a publisher (its good practice, anyway, as anything can happen, even when the parties involved are well-meaning). Now I can finally brag–that’s only a joke. But truthfully, this whole thing comes as a relief. I can’t say that I’ve somehow “made it” (whatever that means), but this is a huge step on the long and often unpredictable journey (aren’t all journeys unpredictable?) of the creative professional. For as long as I can remember, I’ve wanted to write and illustrate my own books, have them published and enjoyed by readers–hopefully a good number of them. 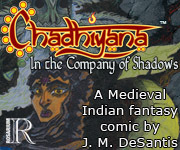 Indeed, the whole reason for setting up chadhiyana.com was to have a means of promoting and publishing the book until I could find a publisher. Little did I know one would find me. You can imagine how excited I am, but signing the mysterious “document of interest” (the contract) is only the beginning. Already some changes have been made, such as taking down almost the entire web-comic at the beginning of the month. The Prologue and two pages of Chapter I will remain on the website as a preview of the graphic novel for new readers (and I hope there will be many). Though, other things will evolve as time progresses. After all, this is my first publishing deal, and again, Rosarium is fairly new, so I’m excited to see how we’ll grow and develop together, as Chadhiyana, in turn, grows and develops. 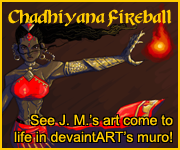 That said, as you’re probably all wondering at this point, what is the fate of Chadhiyana now? Chadhiyana: In the Company of Shadows will continue to publish digitally, but no longer on chadhiyana.com. Instead, Rosarium will be offering the story in bi-monthly (that’s once every other month, not twice monthly) issues until the story is complete. Of course, that means having to wait longer between releases of new content (I know many of you got used to a new page every week), but it also means the story will be published in bigger chunks and faster overall. Issues 1 and 2 of the book will cover the previously published material (the Prologue, Chapter I and Chapter II). Chapter III will start in issue 3. That said, even if you had read up to page 72, I hope you’ll show your support by buying a copy, when they are released–and of course, continue reading after. The only thing I can’t give at this point is an exact date for the release of issue 1. The original plan was April, though with all of the delays, I’m uncertain if this will still be possible. I have to work that out with the publisher, and of course, go by what they feel is best as well. Whatever the release date, I will of course let you all know as soon as I do. For now, it’s a matter of being patient yet again, but at least you know what you’re waiting for and what all this “big news” talk was about. I hope it was worth the wait. That said, as I’ve been saying for about three months now, this news is only the beginning. I have a lot planned for 2015 and beyond. It’s going to be something of a transition year; I’m going to have to adjust and adapt as I go, but it’s also the start of what I believe is going to be something really great. I’ve worked hard to get here, and I appreciate all of the support I’ve gotten thus far. There’s a lot of even harder work ahead, so I can’t relax just yet. Even so, for the moment, I think I’m going to pause and celebrate a bit. I mean, I have a publisher for my graphic novel!